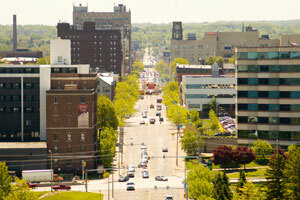 Erie is home to over 100,000 residents and is nicknamed “The Flagship City”. There are advertising opportunities throughout the city to effectively spend your advertising budget. Utilize out-of-home advertising near cultural attractions in downtown Erie such as the Erie Art Museum and Warner Theatre. Target your audience with outdoor billboards or other outdoor advertisements near any of the several universities home to Erie including Penn State Erie and Behrend College. You can also capture potential customers using digital advertising in sports stadiums like Jerry Uht Park. The major highways running through the city can also provide billboard possibilities. Zip Codes: 16501, 16502, 16503, 16504, 16505, 16506, 16507, 16508, 16509, 16510, 16511, 16512, 16514, 16515, 16522, 16530, 16531, 16532, 16533, 16534, 16538, 16541, 16544, 16546, 16550, 16553, 16554, 16558, 16563, 16565.